Choose our lodgings in Indian Rocks Beach, Florida for a relaxing beach getaway. 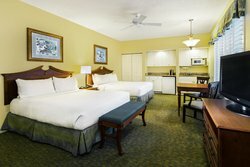 Pleasantly removed from the bustling tourist areas of Florida, our Holiday Inn is located in one of the quieter places to stay in Indian Rocks Beach, perfect for a serene walks along a pristine stretch of white sand. 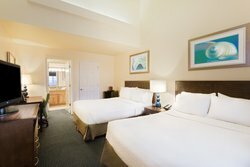 Originally a condo building, our hotel boasts spacious lodgings featuring a unique apartment-style design and layout. Stretch out in the extra space and enjoy all the comforts of home with private kitchens in our suites and villas. Wake up to a beautiful view of the marina each morning, or enjoy your own private Clearwater sunset in the evening. 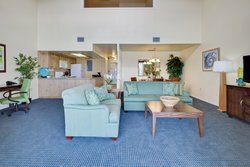 Select from our variety of studios, suites, and villa lofts when you’re looking for a place to stay in Indian Rocks Beach, Florida. 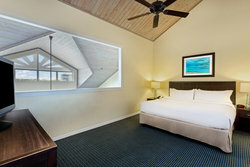 All of our accommodations feature warm wood furnishings set in a palette of clean whites and blues to remind you of the shimmering waters of the Intracoastal Waterway right outside your window. 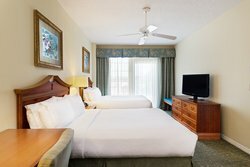 In addition to incredibly spacious accommodations, we also provide accessible guest rooms available in the studios and suites. Find the comfort you’re looking for with lower countertops, grab bars in the bathroom, and roll-in showers. Everything you need and more is right here at our hotel – without any of the traditional resort fees. With Splash Harbour Water Park next door, 18 holes of miniature golf downstairs, a full-service restaurant, and a 50 slip marina, lodging in Indian Rocks Beach with us means you have everything at your fingertips. Enjoy views of our interior courtyard and miniature golf from the Islander guest room with 2 Queen beds. 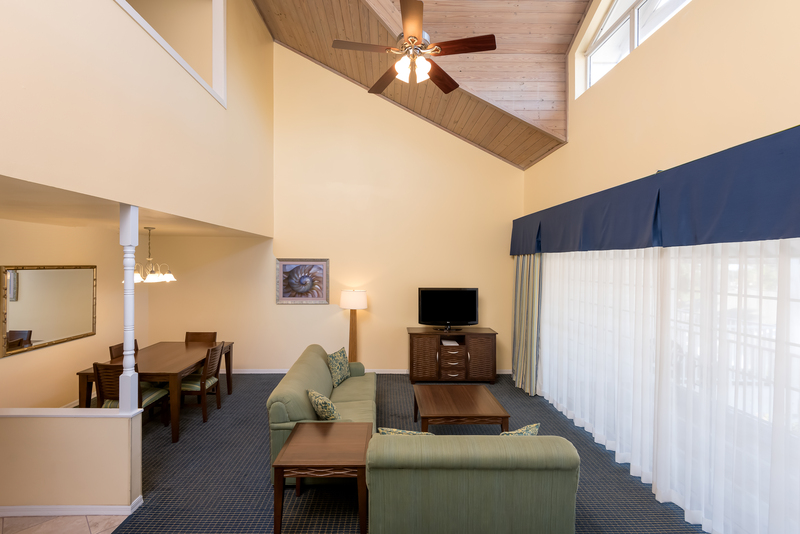 Featuring a vaulted ceiling with a ceiling fan, this hotel room offers thoughtful amenities including a 37” flat screen HDTV, mini fridge, work station, and free Wi-Fi throughout the room. Relax in your oversized guest room with interior courtyard views featuring 1 King bed and a Queen-sized sofa bed. Amenities include a kitchenette equipped with a two-burner stove, mini fridge, toaster, sink, dishware, and a dining area. 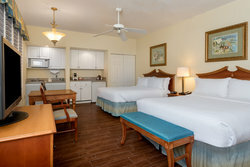 Watch your favorite show on the 37” flat screen TV and stay connected with free Wi-Fi. Originally a condo building, our hotel still boasts spacious lodgings with a unique design and layout that is more familiar to an apartment. 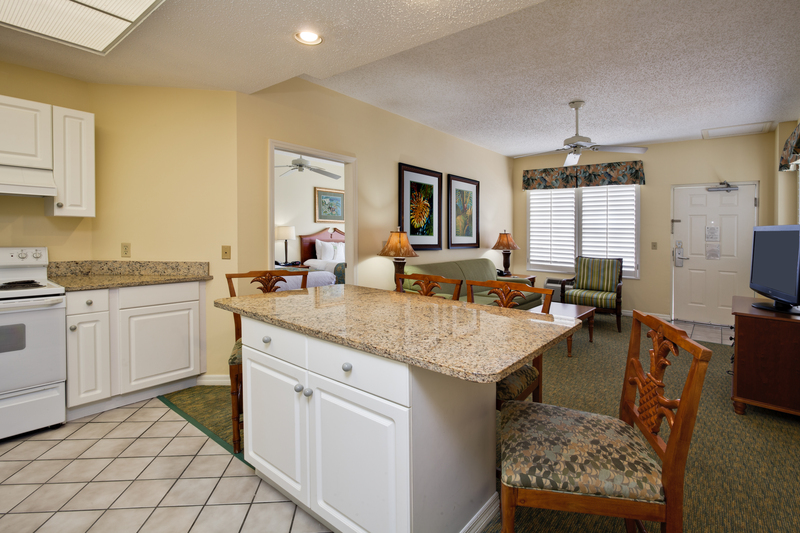 Experience the extra space and comforts of home with private kitchens in each of our rooms. And it’s your choice of waking up to a beautiful view of the marina or enjoying your own private Clearwater sunset in the evening. Relax in your oversized guest room with 2 Queen beds and views of the interior courtyard. 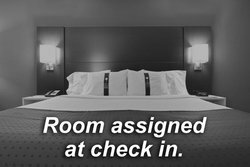 Amenities include a kitchenette equipped with a two-burner stove, microwave, mini fridge, toaster, sink, dishware, and a dining area. Watch your favorite show on the 37” flat screen TV and stay connected with free Wi-Fi. Perfect for traveling groups, this one bedroom suite sleeps 6 people in a separate bedroom with 2 Queen beds and a living room with a Queen sofa bed. 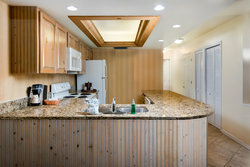 Amenities include a fully-equipped kitchen with a full size fridge, stove, dishwasher, and toaster. 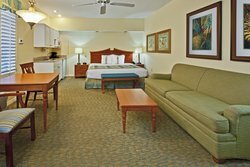 The suite includes 2 flat screen TVs and free Wi-Fi. Perfect for traveling groups, this one bedroom suite sleeps 6 people with a separate bedroom with 2 Queen beds and a living room with a Queen sofabed. 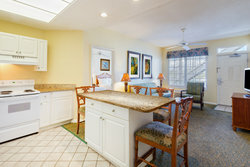 Amenities include a fully equipped kitchen with a full size fridge, stove, dishwasher, and toaster. The suite includes 2 flat screen TVs and free Wi-Fi. This two-story villa sleep 4 people and covers 1200 square feet of space. Our King Villa Loft includes a downstairs living room with Queen sofa bed, a private balcony, dining room, and kitchen. The kitchen has a full size fridge, stove, oven, and dishwasher. Upstairs is a loft bedroom with 1 King bed, a bathroom with an oversized Jacuzzi, and a separate walk-in shower. Perfect for traveling families, this two-story villa sleeps 4 people and covers 1,200 square feet. Our King Villa Loft includes a downstairs living room with Queen sofa bed, a private balcony, dining room, and kitchen. The kitchen has a full size fridge, stove, oven, and dishwasher. Upstairs is a loft bedroom with 1 King bed, a bathroom with an oversized Jacuzzi, and a separate walk-in shower and free Wi-Fi. This two story villa sleep 4 people, covers 1200 square feet, and overlooks the Intracoastal Waterway. Our King Villa Loft includes a downstairs living room with queen sofabed, a private balcony, dining room, and kitchen. The kitchen has a full size fridge, range, oven, and dishwasher. 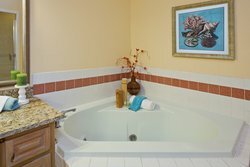 Upstairs is a loft bedroom with 1 King bed, a bathroom with an oversized Jacuzzi and a separate walk-in shower. Perfect for traveling groups, this one bedroom suite sleeps 6 people in a separate bedroom with 2 Queen beds and a living room with a Queen sofa bed. 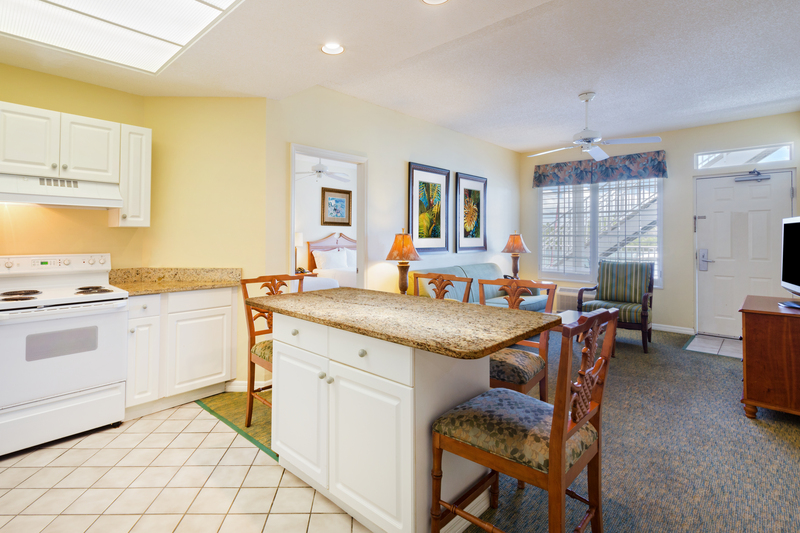 Enjoy views overlooking the Intracoastal Waterway. Amenities include a fully-equipped kitchen with a full size fridge, stove, dishwasher, and toaster. 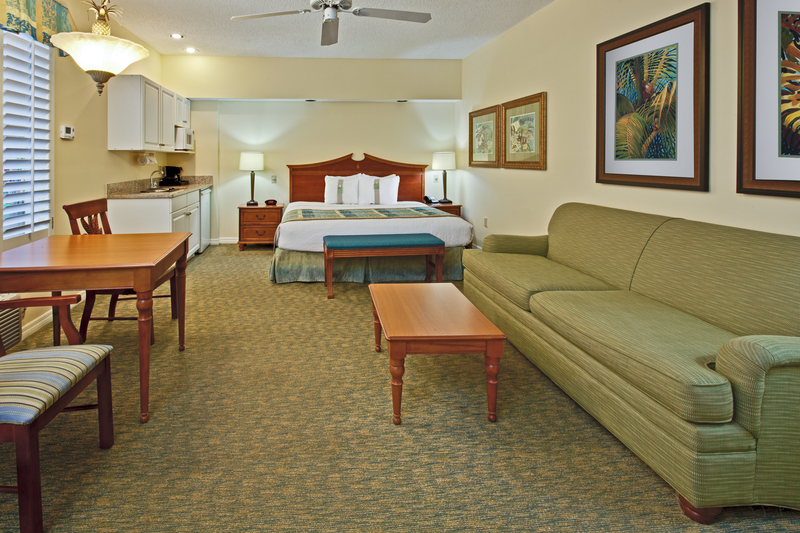 The suite includes 2 flat screen TVs and free Wi-Fi. This two-story villa sleeps 4 people, covers 1,200 square feet of space, and overlooks the Intracoastal Waterway. Our King Villa Loft includes a downstairs living room with Queen sofa bed, a private balcony, dining room, and kitchen. The kitchen has a full size fridge, stove, oven, and dishwasher. Upstairs is a loft bedroom with 1 King bed, a bathroom with an oversized Jacuzzi, and a separate walk-in shower.